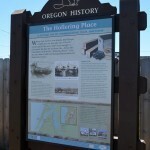 Where this marker now stands, the villages of Qaimisiich on this side and El-ka-titc on the spit to the west, were close enough to call across the bay for a canoe ride – hence the translation of El-ka-titc, “Hollering Place.” Coos Bay has been a trade and transportation center for thousands of years. In 1852, the chartered schooner “Captain Lincoln” ran aground directly west of here on the ocean side of the North Spit. The soldiers and crew men, en route from San Francisco to Port Orford, were shipwrecked. They survived four months bivouacked at Camp Cast-a-way, by trading with the local Natives. 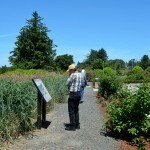 After the castaways were rescued, they extolled the virtues of the resources of the Coos Bay area. Gold was discovered nearby in 1853. During the 1850s gold rush, Empire City became an important transportation link between sea and land travel. The docks bustled, boasting an anchorage deep enough for ocean-going ships, most bound to and from San Francisco. The Henry Luse Mill was built here in 1855 and lumber exports became the region’s most lucrative trading commodity, along with coal. the docks were also busy handling local farm produce, dairy products, and fish harvests. 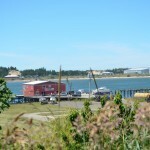 Dredging of the upper bay later allowed large shipbuilding vusineses and lumber mills to develop on the east waterfront of the peninsula at North Bend and Marshfield (today the City of Coos Bay). New railroad and highway development there also drew the population away from Empire City. After the county seat of government was moved inland to Coquille in 1896, the population in Empire City faded. Three of the oldest houses remaining in Coos County are within walking distance. The 1869 house of Maj. Morton and Anna Tower is only one block northeast of here. The 1873 house of Capt. James and Sarah Magee is just below this wayside. The 1872 house of Charles and Minnie Tower is behind you on the north side of Newmark. This house was later owned by Patrick and Ellen Flanagan from 1874-1920.